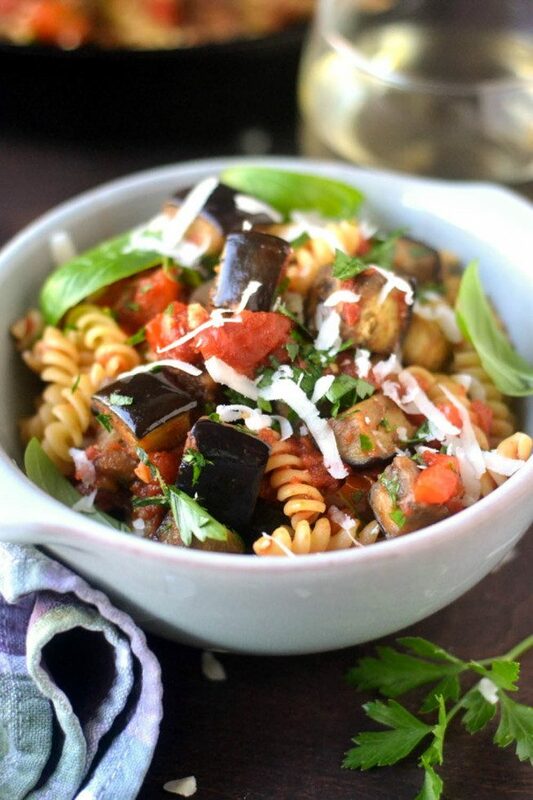 Pasta Alla Norma is an Italian standby, it's earthy, homey, and except for the glossy purple eggplant, is made entirely from pantry staples. Cook the pasta in well salted water according to the package instructions. Wash and slice the eggplant into small cubes. Heat a skillet over medium heat until it is hot and add the eggplant, dry, to the pan. I like to saute eggplant this way because it intensifies the flavor and the eggplant doesn't get soggy from absorbing too much oil. Keep the eggplant moving while you saute so it doesn't stick to the pan. When it has taken on some color is and beginning to soften, remove it to a plate. Add 2 tablespoons of oil to the same pan and saute the onions, red pepper flakes, and garlic for several minutes until the onion starts to soften. Add the tomatoes, tomato paste, wine, and vinegar to the pan, along with the eggplant and stir to combine. Bring to a simmer. Season the sauce with salt and fresh cracked black pepper to taste. Toss with the just cooked pasta and adjust the seasonings, if necessary. Serve hot, topped with lots of freshly grated cheese and a generous sprinkling of parsley.